1 of 3 Heat oven to 350 degrees . Butter and flour three 9-inch round cake pans. Line the bottom of each with a circle of wax paper. 2 of 3 In a medium bowl, whisk together flour, cocoa, baking soda, baking powder and salt; set aside. In a second medium bowl, whisk together sour cream and coconut milk. In a large bowl, beat butter and sugar on medium speed until fluffy, about 2 to 3 minutes. Add eggs, one at time, beating well after each addition. Beat in almond and vanilla extracts. On medium-low speed, beat in flour mixture in three additions, alternating with coconut milk mixture, beginning and ending with the flour mixture. 3 of 3 Pour batter evenly into prepared pans. Bake at 350 degrees for 25 minutes, or until a toothpick inserted in the center comes out clean. Cool in pans 10 minutes, then turn onto a wire rack and cool completely. 1 of 1 Heat cream in a small pot on medium-high heat just until it simmers. Immediately pour over chocolate in a medium bowl; let stand 3 minutes. Add vanilla and mix until smooth. Cover and cool to room temperature. 1 of 2 Meanwhile, in the bowl of a stand mixer fitted with the whisk attachment, beat the butter and sugar on medium-low speed until blended, about 1 minute. Increase speed to medium-high and beat for another 3 minutes. Add vanilla and 3 tablespoons water and beat on medium-high speed for 30 seconds. Add coconut and almonds and beat for another 30 seconds. Set aside. 2 of 2 To assemble: Place one cake on a stand (if slightly rounded, trim off a bit to make it flat). Spread 1/2 the filling on the cake. Repeat with second cake and remaining filling. Top with the third cake (do not trim). 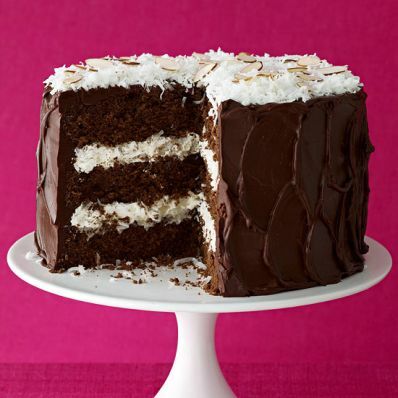 Ice cake evenly with chocolate ganache. Garnish with coconut and almonds.